Episode 2 once again manages to impress and deliver with its hysterical jokes and sarcasm but also adds in some sentiment and sympathy as we learn a little bit more about the other characters in the drama. Just as Bong-sun’s confidence and thirst for affection continues to show even more in this episode, so does Sun-woo’s relationship with his mom where we learn a little bit more about their complicated relationship and feelings for each other. 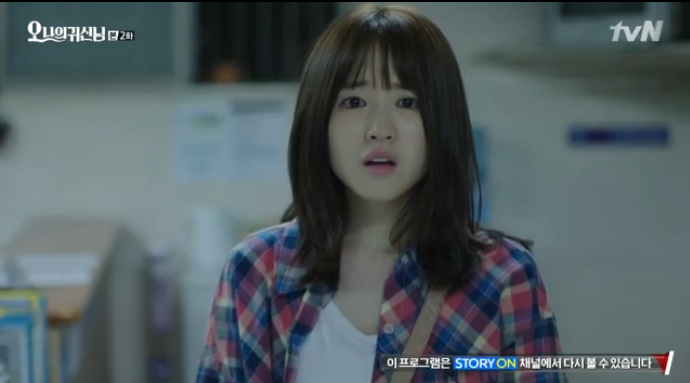 From where we left off in episode 1, Soon-Ae (Kim Seul-gi) had already entered Bong-sun’s body and possessed her. Now with the spirit of a witty, out-going, and adventurous lady inside of her, Bong-sun’s personality has completely changed. She arrives at the restaurant where everyone awaits her arrival. Boss Sun-woo asks her for the key to the back storage room since she was the last one to enter the room, but Bong-sun remains oblivious. Everyone there think she’s joking around and playing dumb but really Bong-sun doesn’t know (because it’s not her!). Sun-woo extends his hand, expecting the quiet and timid Bong-sun he once knew to quietly hand her the keys but instead she throws him onto the floor once he attempts to search her (LOOOL YOU GO BONG-SUN. GIRL POWER!). Everyone is shocked at the sight of a small Bong-sun flipping a grown man like Sun-woo onto the ground and are in utter confusion as to if this is the Bong-sun that they knew all along. They suspect her of being drunk and yell at her to apologize to Chef Sun-woo immediately but Bong-sun remains confused (Chef? Who’s chef? Who is this person that I just threw onto the ground right now? Hahaha). 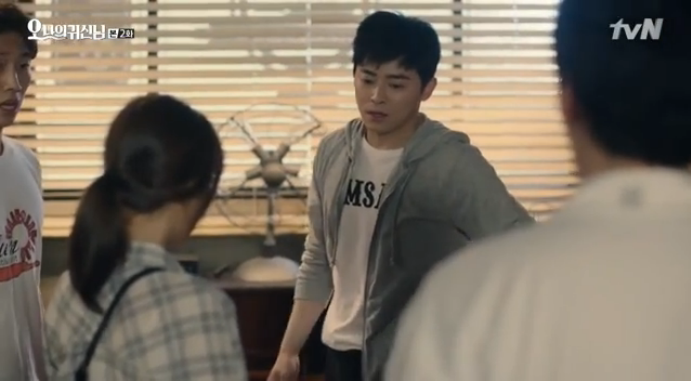 Bong-sun manages to find the key to the storage room in her pocket and hands it to Sun-woo who immediately takes it and walks away to the storage room. Meanwhile, everyone is amazed at Bong-sun and questions her but Bong-sun pays no attention to them. Soon-Ae, realizing that maybe being in Bong-sun’s body isn’t too good for her, tries to escape and flee out of the body but finds it impossible. She realizes that Bong-sun is the perfect match for her soul and is unable to leave (tsk tsk tsk, didn’t take the shaman’s warning seriously). Soon-Ae causes Bong-sun to faint once she realizes what has happened. Everyone gathers around her in panic and fear as they ponder over what to do next. They ended up placing Bong-sun on a table in the restaurant, discussing over her fainting incident. But Bong-sun didn’t faint; she’s actually conscious but just pretended to faint to escape the situation earlier. She deliberates over whether she should wake up or not and reaches her decision once she slightly opens her eyes to see well…a certain body part from the guys that makes her lick her lips and think twice about working at the restaurant. “It might not be so bad after all,” Soon-Ae adds after having seen that body part. Sous Chef Min-soo tells Bong-sun to wake up since he saw her open her eyes slightly earlier. He knows she’s just faking it now. Hahaha. Sun-woo’s younger sister, Eun-hee, ends up treating Sun-woo’s injuries that he got from Bong-sun. Eun-hee encourages Sun-woo to give Bong-sun another chance to work for him even though she was the one who had written the resignation letter herself. The guys push Bong-sun into the dressing room that the siblings are in so she can apologize to Chef, causing their sibling time to be interrupted. Eun-hee voluntarily leaves to let Sun-woo and Bong-sun talk to each other and figure things out. Once alone, Bong-sun starts off by admitting that she did wrong when throwing Sun-woo onto the floor and asks for forgiveness. This doesn’t cut it for Chef though and he gives her…well…what he gives best – a lecture. Okay, so maybe it’s not a lecture, but a compromise. Sun-woo will give Bong-sun one month and within that month she is to decide whether she thinks being in the kitchen is right for her or not. Unexpectedly, Bong-sun excitedly calls it a deal and jumps up while doing so, scaring the life out of Chef (HAHAHA omg so funny). They even shake hands to make it official. Lolol. Scared, Chef walks out of the room in disbelief that the Bong-sun he once knew is standing in front of her. Bong-sun takes some time to wander around in the kitchen and become familiar with it since the restaurant hasn’t opened yet. She admits that for some reason she doesn’t feel strange being in that kind of environment and rather likes it. She looks at knives, lits the stove on fire, and tries things that she has always wanted to do. She is interrupted though when the other guy chefs come entering the kitchen reminding her that her station is in front of the dishwasher. Chef Sun-woo hands Min-soo another assignment to which Min-soo gives it off to Bong-sun to do but she complains. “He told you to do it so why are you telling me to do it? !” OMG THIS IS TOO FUNNY. I LOVE HOW SASSY SOON-AE IS INSIDE OF BONG-SUN WHICH JUST THROWS EVERYONE OFF. She quickly apologizes and excuses herself to go to the restroom. Soon-Ae can’t seem to figure what kind of person Bong-sun was like; if she had an idea, then it would make things easier for her. Good luck finding out Soon-Ae! The restaurant opens and just like usual things are busy. While everyone else is busy cooking, Bong-sun is busy washing dishes at her station. She is delighted when Joon (Kwak Shi-yang) stops cooking for a little bit to wipe off his sweat and cool down and stands near her to do so. He flaps his shirt up and down exposing his stomach and wipes the sweat off his neck teasingly. Bong-sun sure is a happy girl, her eyes wide opened in excitement and her hormones raging. LOL. (omg this is so awkward for me to write. Hahaha). 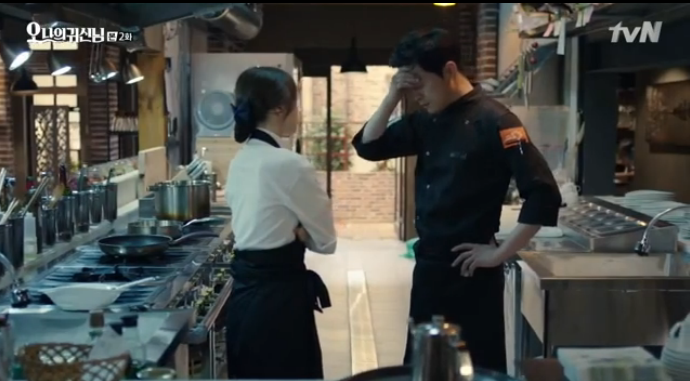 She is interrupted when Chef Sun-woo calls for her to mop the floor. She literally mops for two seconds and returns the mop back to its original place only to get scolded by Chef because he almost slipped. After reminding her not to mop the floor with water because it’s dangerous in that someone can slip, he asks her if this is her way of getting revenge (and he’s literally asking her this while holding a cucumber in his hand and pointing it at her! LOLOL). Bong-sun is rebellious, talking back to her boss and complaining that she’s busy. Once she leaves, Chef receives a call and even his excuse of working isn’t enough for what is to come. In the next scene, we see Sun-woo in the police station, bewildered and enraged over a complaint that was filed against him for assault. This complaint was filed by none other than the photography woman that was kicked out of the restaurant the other day for mistreating Bong-sun and embarrassing her in front of the whole restaurant. No matter what Sun-woo says, it doesn’t change the fact that she has filed a lawsuit against him. Uh-oh. Back at the restaurant, all the guy cooks and Bong-sun gossip about the assault charge that has been filed against Sun-woo. 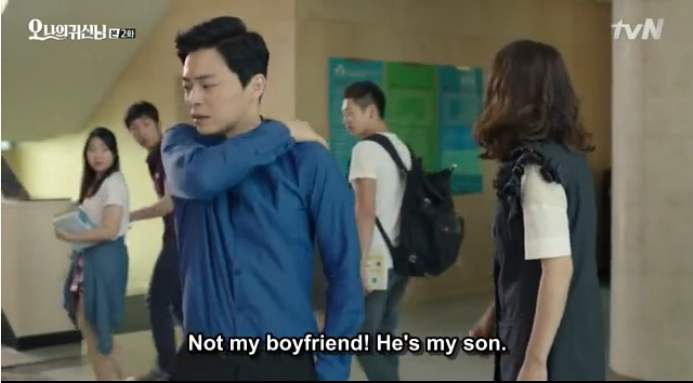 She asks the guys if Sun-woo really did punch anyone when the incident happened which confuses the guys. They’re like, “You’re the one who caused it. What are you talking about?” LOL. Awkwardddd. While pretending to recall the incident, Bong-sun plays around with Joon’s fingers, making everyone confused and baffled. Bong-sun quickly removes her fingers and pretends that she lacks affection so she tends to get attracted to skin. Hahaha. Omg, perfect excuse! She slowly retreats and brings up another subject to distract the guys but it doesn’t seem to help. Bong-sun is still embarrassing herself. The four cooks can’t seem to put up with Bong-sun anymore and eventually leave the kitchen to discuss about her. They feel like she’s Bong-sun but she isn’t (to which one of the cooks makes up lyrics about the situation and sings it to the rhythm of SoYu and Junggigo’s hit song ‘Some.’ omg this is hilarious and genius!). The four guys conclude that maybe she has Intermitten Explosive Disorder. Ya know, that disorder where like you get outbursts of rage and you go crazy and murder people for no reason. It’s especially bad when employees receive bad mistreatment by their bosses so they eventually explode and stab and cut and thrust and murder. One of the cooks predicts that Bong-sun could be going through this disorder but the other guys don’t believe him. “No wayyyyy” they all say. That can’t be. However, their ‘no wayyyyy’s changes into ‘yes wayyyyy’s when they enter the kitchen only to find Bong-sun with a sharp knife in her hand, swinging it around them and pointing it at their faces. LOLOL. She goes off about the knife complimenting it in many ways and asking questions like “can it kill people?” while all the guys panic and plead for her to put it down (one cook is even holding up a spoon in self-defense, lolol). OMG. THIS SCENE IS GOLD. Bong-sun eventually scares the cooks away and out the kitchen door. Hahaha. Sun-woo leaves the police station, still furious over what happened. Brother-in-law Cop Sung-jae comforts him by handing him a drink and advising that maybe he should just apologize to the photographer. But Sun-woo is stubborn and refuses to do so. The guys are taking a shower together at the restaurant only to freak out when they find Bong-sun at the door peeking in at them. LOLOL. OMG BONG-SUN PLEASE. Bong-sun catches up with Joon (BAEEEEEE) while he’s leaving work. She suggests grabbing some beer together to which he surprisingly doesn’t decline. But what is not surprising is when he rejects Bong-sun’s request to rest together because he rather prefer to rest at home. He leaves Bong-sun behind but Bong-sun doesn’t know where she lives. Fortunately she finds out when the owner of the dormitory calls Bong-sun to remind her to leave the complex (reminder that Soon-Ae is inside Bong-sun’s body). At home, Chef Sun-woo searches the blog of the photographer that had filed a lawsuit against him. He finds a post written by the photographer saying bad stuff about his restaurant like they have no common sense when it comes to either service or food, which only angers Sun-woo even more. To make himself feel better, he posts several different comments – each with a different account name – saying positive stuff about his own restaurant to defend himself and his restaurant and to regain his pride. Haha. The next day at work is hectic. An article about the assault was released and it’s tarnishing Sun-woo’s image and reputation and affecting those around him. Even through all this, Sun-woo is not shaken and refuses to apologize. The guys are worried about what’s going to happen now that everyone believes Sun-woo supposedly beat up a woman. Everything literally goes from concern and sadness to rainbows and unicorns the moment Bong-sun bursts into the room with her loud and high-pitched “GOOD MORNING!” Lolol. I love the new Bong-sun. At work, Sun-woo receives a call from the police commissioner that Sun-woo’s mom has talked to the photographer and has figured things out by apologizing and delivering money to the woman for the agreement. Sun-woo is mad and confronts his mom about it. Why would she get involved in his personal affairs? Mom complains that she’s his son and it’s her responsibility to take care of him. That’s when Sun-woo brings up memories of his childhood, with not having a proper childhood and not having his mom be there for him growing up. Sun-woo adds that he’s 33 years old now and doesn’t need his mom anymore. Instead, where was she when he did need her earlier in his life? But Mom couldn’t help it at that time; she was too busy studying, eating, and living to be with Sun-woo and to raise him. Ugh, this breaks my heart (why can’t y’all just get along? T__T). They end their argument by agreeing to just mind their own business but Mom can’t let that happen so easily. She starts hitting Sun-woo outside of her office which grabs the attention of students walking by (Mom is a professor) so to make herself look innocent, she smiles at them and pretends that Sun-woo is her boyfriend, not her son. LOL. Sun-woo agrees to send his mom money to compensate for the money that she used on the agreement. Sun-woo meets up with his friend So-hyung where they end up talking about the new TV program that she’s in charge of. She had previously asked Sun-woo to appear on it, but he respectfully declined. He gives her offer a second thought. The cooks can’t seem to stop worrying about Sun-woo and the restaurant. It doesn’t seem like all the attention is going to die down anytime soon (we also learn that Min-soo might be one of those annoying netizens who likes to criticize and say mean harsh comments about celebrities lol). Other chefs are ecstatic at the sight of Sun-woo’s downfall (that means they can finally get a chance at success!). To counter-attack, Sun-woo decides to go on So-hyung’s new TV program in hopes of clearing his image and reputation. He will need a second chef at his side during the program to assist him so he asks Min-woo to which Min-soo of course excitedly accepts. Haha. While walking home, Bong-sun notices a crowd that has gathered outside of an apartment complex. She approaches the crowd not because she’s curious as to what’s happening but because…she’s interested in one of the police officers who is none other than Officer Sung-jae. LOL. When the corpse is brought out from the apartment complex, he covers the eyes of a young child standing in front of him, melting Bong-sun’s (and mines too I gotta admit) heart. SOOO COOL OPPAR. The next day Sung-jae heads to the same restaurant that he frequents often. He comes just in time to solve an incident from almost happening and saves the day with just his presence alone. YAAAAAAAY. It’s the day of the recording for So-hyung’s new TV program. 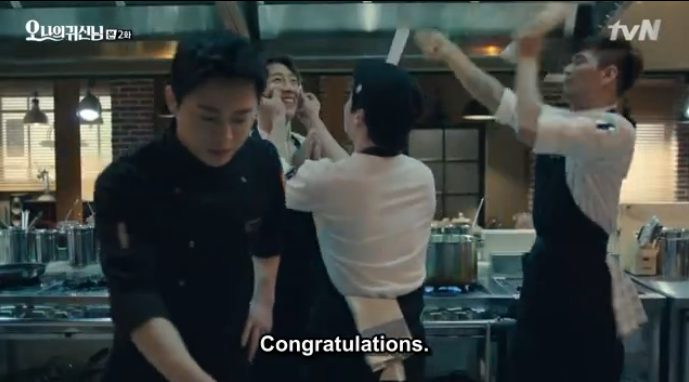 As preparations are being made, Min-soo forgets Chef’s very own knife specialized just for him and calls Bong-sun who is at the restaurant at the time to deliver it to him. As Bong-sun prepares to drop off Sun-woo’s knife, Mom meets up with the shaman to talk about her son. The shaman reveals that she’ll need to see Sun-woo in person herself to get a better sense of his fortune so they both head over to the restaurant, just in time to encounter Bong-sun who tries to avoid them both (especially the shaman since it’s not Bong-sun but Soon-Ae that’s inside of Bong-sun!). Once the problem is solved, the recording starts and the mission that the chefs will have to work with is revealed. We find out that the mission sent in has to do with a meal that would be cooked for a son who drank the night before. 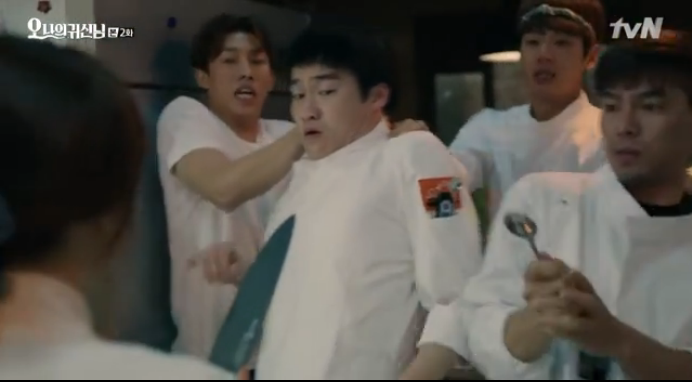 Chef Sun-woo seems to panic once he finds out what the mission is while his competitor doesn’t seem so affected. Sun-woo faces obstacles along the way while the other chef seems to be doing just fine. In fact, he prepares his dish while there’s still time remaining. Sun-woo doesn’t seem to know what he’s making but that’s when Bong-sun comes to the rescue. Noticing that the rice they cooked is burnt and that there’s not a lot of time left to cook a whole new meal, Bong-sun decides to mix in the broth from one of the pots they were cooking with with the rice, calling it burnt rice pollack soup. We return to a flashback of the restaurant owner that Officer Sung-jae visits often (who I am also assuming is Soon-Ae’s father). He reveals to his customer that they don’t serve the burnt rice Pollack soup anymore which was what the customer had wanted to eat. It’s a bitter scene as we also find out that the owner’s daughter isn’t around anymore and had left somewhere. Maybe that’s why the owner doesn’t serve the soup anymore. That night, while walking home from work, Bong-sun comes across a drunk man roaming around the street. She eventually brings him to the police station since she’s unable to get in contact with any of his family members. Although she tries to leave, Officer Sung-jae, who works at the police station she brought the drunk guy to, manages to persuade her to stay so that the dad of the son can thank Bong-sun personally for rescuing his son. The father, who is also the restaurant owner, soon enters the police station worried but grateful. While trying to get his son Kyung Mo to awaken, something triggers inside of Bong-sun and causes her to grow dizzy. That’s when we find out that this man that we had been seeing quite often in this episode is Soon-Ae’s father and that Kyung Mo is her younger brother. The way that her dad had been trying to get Kyung Mo to wake up reminded Soon-Ae of the way she would do the same when she tried to wake him up. It’s all too familiar for Soon-Ae. Flashbacks of Soon-Ae helping her father run the restaurant are shown which explains why Soon-Ae feels familiar in the kitchen. We also learn that it was Soon-Ae who had come up with the rice Pollack soup which makes sense as to why her father stopped serving it once she passed away and how Bong-sun was able to come up with the idea of the burnt rice Pollack soup during the TV program recording (OMGGGG THIS IS SO HEART-BREAKINGGGG). Bong-sun can’t believe what she has discovered and what she is seeing in front of her. Tears fill her eyes as she comes to the realization that it is her dad and brother who is front of her. Ok. 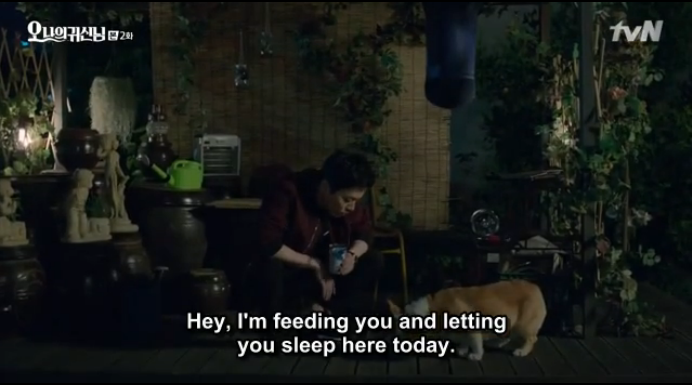 The second episode of oh my ghostess is my very first encounter with k dramas. Im more than impressed. I did want to ask, who is the designer of the tshirt worn by the chef i think… it was a white tshirt with the mlk speech silkscreened into the lower portion of the shirt… who is it, where can I get it; because I must have it. Lol. Thank you if anyone sees this.